Our product range includes a wide range of turbo ventilators. 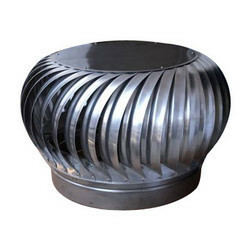 Our organization is counted amongst the most distinguished manufacturers, suppliers and traders of Turbo Ventilators. These are designed to exhaust industrial pollutants such as smoke, dust, poisonous gases, humidity, fumes, heat and many more invisible irritants from the covered area. We manufacture these products using high grade material that is sourced from reliable vendors.